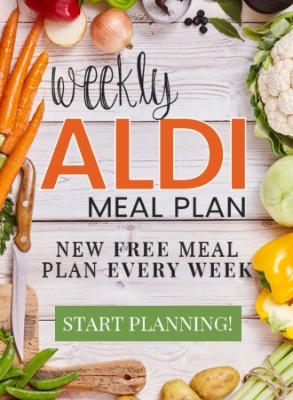 How about a new recipe featuring this week’s impulse buys at ALDI — Let’s hear it for affordable experimentation, right? 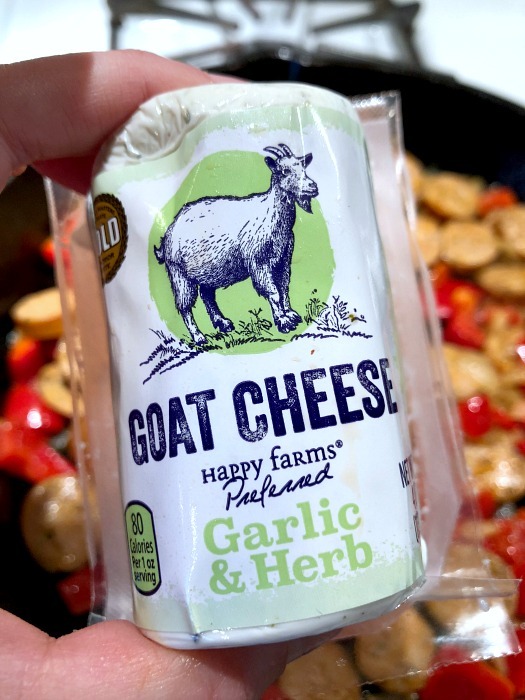 Their garlic & herb goat cheese is back in stores and on sale this week (just $1.79 at my store! ), and we’ve really been enjoying the apple chicken sausage. 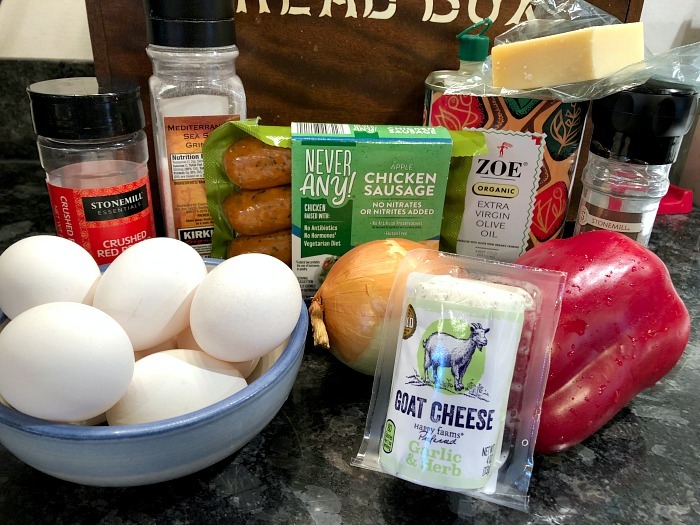 One lonely red pepper was also rolling around in my fridge, so instead of doing the typical sausage, peppers, and onions thing, I thought it would be more fun today to incorporate the goat cheese as well and cook everything up as an easy one pan dinner recipe. 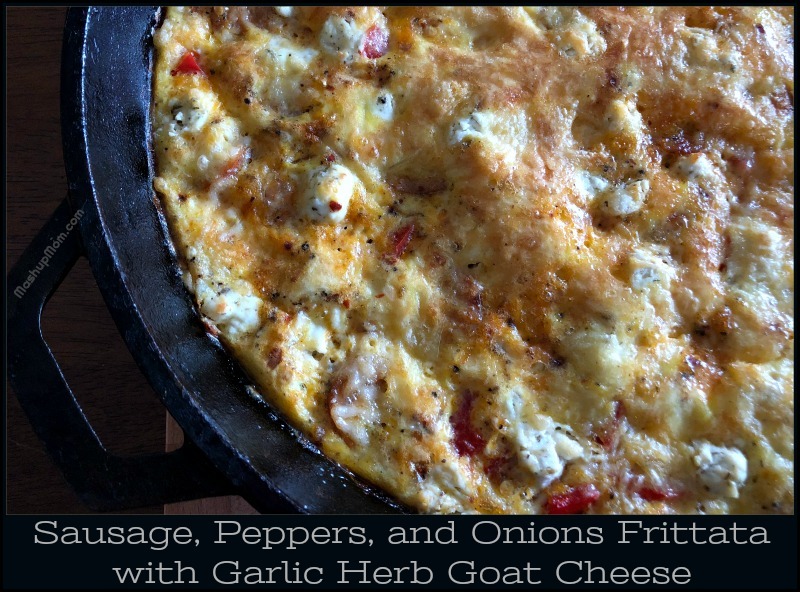 Hence, today’s creation: Sausage, Peppers, and Onions Frittata with Garlic Herb Goat Cheese! Well, isn’t that just a beautiful skillet full of low carb, gluten free goodness? This easy weeknight frittata recipe brings in all the savory flavor of traditional sausage, peppers, and onions, but packs an extra wallop of flavor from the garlicky goat cheese — plus, you get to enjoy the contrasting (yet complementary texture) of the creamy eggs, and just a little salty tang from the Parmesan topping. Preheat oven to 400 degrees. Heat olive oil in a 12″ cast iron skillet over medium heat until shimmering, then add onion and saute for about 2 minutes. Add bell pepper and continue to cook over medium heat for another 2 minutes. Add sausage and continue sauteing over medium heat for another 5-6 minutes, stirring occasionally, until sausage is browned and pepper is softened. While the sausage, peppers, and onions are sauteing, whisk together the eggs, sea salt, pepper, and crushed red pepper in a large bowl until well blended. 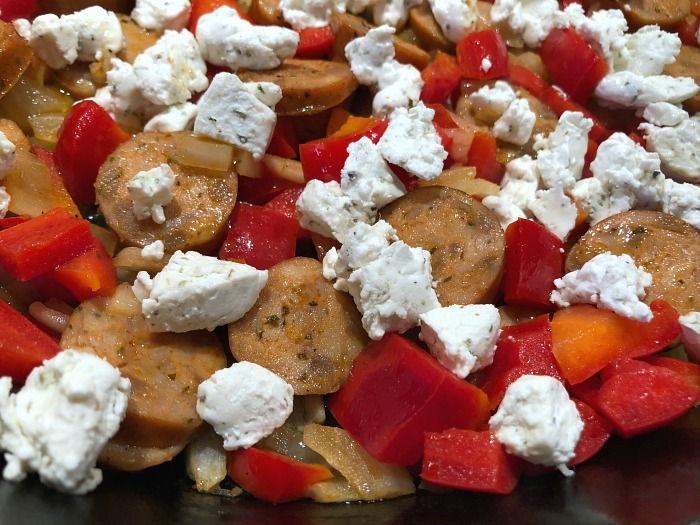 Spread the sauteed pepper and sausage mixture out evenly across the bottom of your skillet and dollop it with goat cheese. Increase the heat under the pan to medium-high. Pour the egg mixture into the skillet on top of the sausage, peppers, and onions and continue cooking undisturbed over medium-high heat just until the edges start to set (about three minutes). 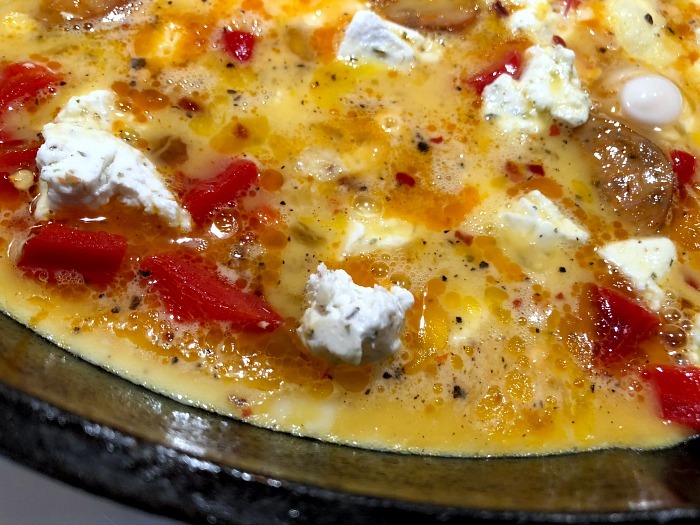 Turn off heat under the pan and sprinkle the frittata with Parmesan, then move the skillet into the oven and bake at 400 degrees for 12-14 minutes, or until set. Broil for another two minutes to brown, then remove from oven and let your sausage, pepper, and onions frittata cool for at least five minutes before slicing. 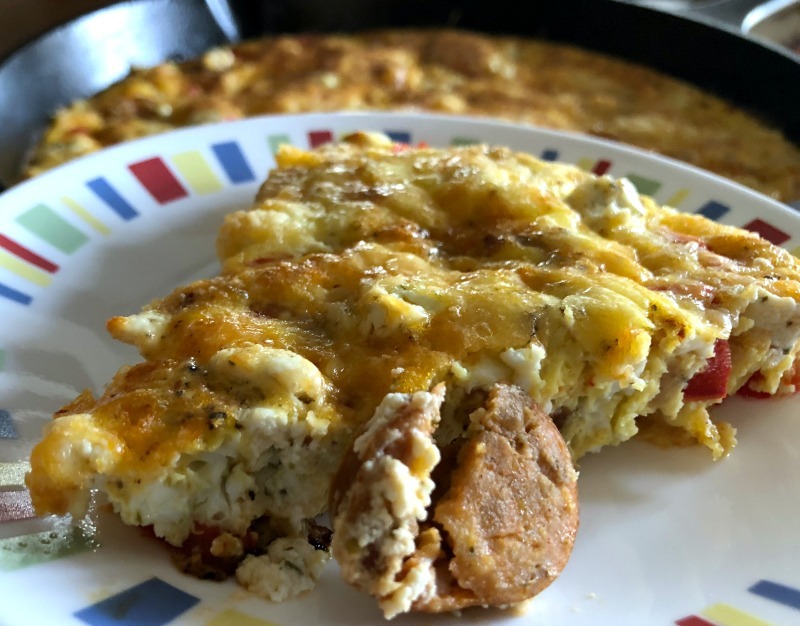 Have this savory sausage, peppers, and onions dinner frittata on your table in about 45 minutes start to finish. I know it will be hard to wait those 45 minutes, because the aromas wafting from your kitchen while the frittata is baking will be absolutely maddening, but stay strong — and do let it cool a bit before slicing, so that it’s easier to get out of the pan. 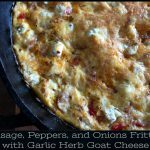 This weeknight frittata dinner recipe is naturally low carb and gluten free. 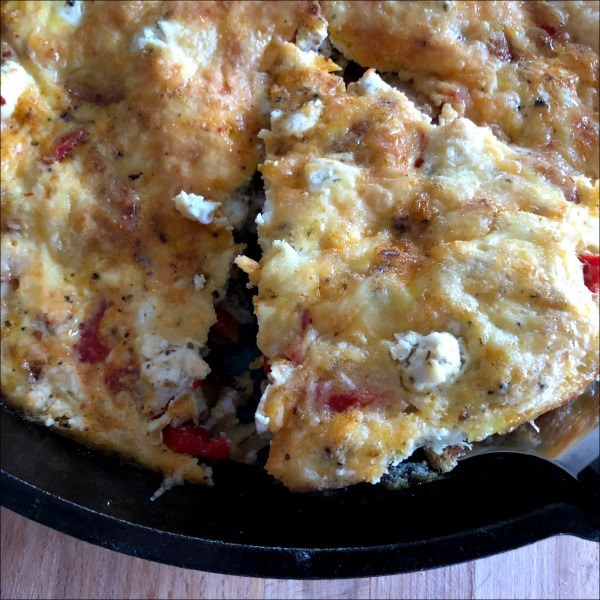 This easy weeknight frittata recipe brings in all the savory flavor of traditional sausage, peppers, and onions, but packs an extra wallop of flavor from the garlicky goat cheese -- plus, you get to enjoy the contrasting (yet complementary texture) of the creamy eggs and just a little salty tang from the Parmesan topping. Preheat oven to 400 degrees. Heat olive oil in a 12" cast iron skillet over medium heat until shimmering, then add onion and saute for about 2 minutes. Add bell pepper and continue to cook over medium heat for another 2 minutes. “Wow babe, this is amazing”, these are the words my hubby said as he ate. Even my 2 year old finished his dinner. The chicken sausage was surprisingly delicious, the goat cheese made a great side kick in this dish. Way to do it again! Awesome! So glad to hear that your family enjoyed — their chicken sausage is always a favorite over here. Can this be done in an oven? I was wondering if I can cook the onion, pepper, sausage in a pan and then add that and the eggs to a pie plate? Thanks! If you don’t have a cast iron skillet you could certainly transfer it into another dish to bake. It won’t get quite as browned etc., but should still be good. If you’re not pre-setting the eggs on the stovetop you might want to add a little bit to the cooking time, too. This was good, except we didn’t care for the goat cheese. We may try feta next time. Love the chicken sausage and this use of it. Having one of our family’s favorite meals tonight. Love the simplicity and full flavor of of this meal. Can’t wait to eat it, yum! Wow. Every single one of your recipes has been amazing (I’ve been following for a few weeks now) but this one I find myself craving. Just made it again tonight for dinner and had to say thank you! This is absolutely delicious. The flavor is amazing. Thanks! Made this tonight for my family. We substituted garlic and herb cream cheese spread for the goat cheese, as my husband is sensitive. Everyone really enjoyed it! Even my picky eater husband!!! So yummy!! love the sweetness of the Chicken Apple Sausages with the tangy goat cheese!! Soooo good! I used sausage I had on hand (ground italian) and I will be adding this to my regular rotation! Thanks for sharing!